Almost 2 weeks long overdue race report. Better be late than No report at all. The event was held last 13th November 2011 at Sri Manjung , Lumut Perak. It was a HOT day indeed. We arrived at our hotel on Friday night around 9:45pm. A 3:30 hours drive from KLIA to Lead View Hotel at Sri Manjung Perak. The transportation from KLIA to the hotel cost us RM550 and this was from the event organizer. Not that cheap but there was no choice. Arrived at the hotel, checked in to the room and unpack and assemble the bike. ALL in ALL, all 3 bikes still in one piece. Nothing is broken except for a few scratches. Off to bed around 12am and I still need my extra hours of sleep since the past few days, I didn’t have enough sleeps. Early Saturday morning, as usual I woke up early around 6am (only 6 hours of sleep) and it was raining. We were planning to test our bike but that is not going to happen. Hopefully tomorrow will be raining also. The gloomy weather continues until the night. We had a late breakfast around 10:45am at McD and after that at around 12 noon we picked up our race pack and did some shopping since there were a few sporting merchandise sold at a very low discounted price. The Powerbar booth – they were selling at a very low price and they even gave a free Powerbar water bottle. siok nyaaaaa. Ali with his new attire – a 2 piece ZOOT top and tight. So everything is a match with his bicycle, helmet and shoes. Yellow and black. On race day, we arrived at the venue around 6:15am. It was just a short 5 minutes bike ride from where we were staying. As usual after setting up all the gears at the transition point, we did a little warm up, then to toilet and then warm up again and toilet brick again. The race start at 7:30 am exactly, The weather was still a bit chilly. I was nervous as if this was my first time. It was a 11km run (2 loops) and it was a hard run. Now I remember why I don’t like this run. The route was more of a mind guessing run. The route seems too long and too many junction. I’ve managed to run around 55 minutes and Zaeidi around 50 minutes for our 1st run. Not much improvement from previous time. The cycling part – 64km (2 loops) is the fun part. I really enjoyed it. 1st run a lot of people ran faster than me but in cycling, I managed to overtake a lot of cyclists – too many. I overtook around 50 cyclists but those who managed to overtook me again is less than 10 cyclists. I can say that the 3 of us managed to ‘sayur’ (conquer) everyone on the climb. The bridge is like those in Miri, you know the bridge just right after the TOL, very long climb and flat at the top and a long way down. Sapu bersih punya. Even though the cycling was good, but I still got cramped on my leg and also even Zaeidi who is doing really fast on his bike, got cramped. For me, that shows that the training is still not enough or we have push beyond the limit of our capabilities. End result – CRAMPED. I think I managed to get sub 2 hours for the 64km bike. My second run (10km) after the bike, was not that good. The leg felt like a brick – heavy and pain everywhere. Run time result was 1:09 hours. It was a very hot run and for the very first time in any race I have participated, the organizer at one checkpoint provided a very big container full of water and ‘gayung’ in it for everyone to take a scoop of it and cool down their overheat body. Super Good……………………. Since this is our second time here, each one of us has a target time to break. Zaeidi target time was 3:30 and my target was to get sub 4 hours or better 3:45 and Aliuddin target time was 4:45. If according to chip time, Aliuddin managed to get 4:44:36 but the official time (gun time) was 4:45:10. Comparing the results with 2008 results, there was some improvement but not much. 2 minutes improvement while Zaeidi had improved a lot by 15 minutes (very good). I could have done 4:05 if not for the 2 toilet stops. 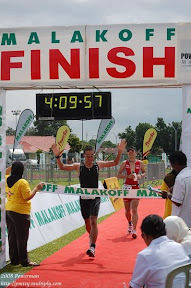 I’m still thinking whether to do next year Powerman 2012, I still need to get those sub 4 hours time. We went back to Brunei on Monday and we have to take the early bus from Lumut Perak around 5:30am. This was the free transportation provided by the organizer for the Elite and since there was still room in the bus, they slot us in. Thank you very much. Overall, the race was a good one. Very tough and challenging. Hopefully I can come again and try to get sub 4 hours. Triathlon Vs Duathlon – each has its own difficulties. Note: NOT a very good report, a lot of information is missing since I almost forgot what had happen 2 weeks ago. Next time, it would be good to produce the report before the 3rd days of completion while it is still fresh.